Crucible is the only blooded fortress left, but not for nothing is it called the City of Kings. Its defences are unbreakable, its walls unassailable, all built so one hundred can hold back a thousand. Worse yet, the Black Thorn is running out of time and there are darker things hiding underground, looking to turn the city into a tomb. City of Kings takes you back to the Untamed Wilds and is a stand alone First Earth Saga novel, designed to be read independently of the other series, yet also continuing to add to the ongoing larger story of First Earth. 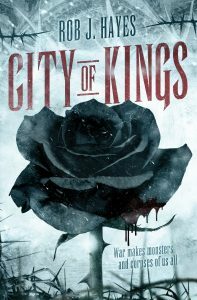 City of Kings can be purchased from Amazon here.